Widington Hydro Scheme. Nun Monkton North Yorkshire. 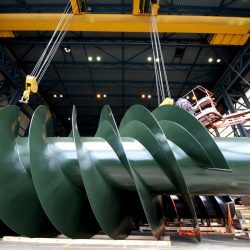 We were asked by a client in the UK to advise on how best to deliver the largest Archimedes Screw ever produced for green energy production, from Sneek in the Netherlands to the Widdington Hydro Project on the River Ouse at Nun Munkton in North Yorkshire. The project was particularly challenging due to the extreme dimensions of the screw. When assembled it was over 12 metres in length, 5.7 metres wide and 5.5 metres high. Over a two year period prior to the final delivery in June 2017, SLS worked closely with the manufacturer, the client and authorities so as to determine the most economical and least disruptive solution in order to deliver the screw on time and on budget. It became apparent early on that due to the extreme dimensions it was not going to be possible to move the screw by road in the Netherlands. Bridge heights and other width restrictions along the route meant this was not possible. The solution was to transport the screw in two pieces by barge to Rotterdam, using the extensive inland waterway network in the Netherlands, and to then transfer the screw and its trough onto specialist ‘Wafer Deck’ low loader trailers for onward transport by sea ferry to Hull docks on the east coast of England. A barge was chartered of suitable size, a floating crane booked in Rotterdam and the cargo arrived precisely on time, ready to be transferred to the waiting trailers. A significant amount of effort went into planning this section of the project to avoid unnecessary down time between the barge arriving in Rotterdam and the ferry departing for the UK. Prior to this, time had already been spent in the UK consulting with key parties such as Highways England, Yorkshire Police, and local bodies to determine a suitable ‘High Load Route’ for the screw. At 5.5m high when loaded, this negated the use of any motorway in the UK as bridge heights are generally 5.0m. At 5.7m wide, a different route was needed to accommodate the trough. A solution was found that, with accurate timing, allowed both pieces to arrive on site within 30 minutes of each other, despite the last 2 miles of the journey being across single track unmade roads and tracks to the river’s edge at Linton Lock on the Nun Munkton estate. The planning process required attention to detail and many hours of discussions with stake holders and key parties in order to deliver a solution for the client that was on time, on budget and caused the least disruption to local communities along the route. The SLS team’s expertise and attention to detail ensured the project’s success. No matter how complex the task, SLS prides itself on being able to apply their extensive knowledge and experience to provide clients with realistic, workable solutions.